Diatonic scale on C Play (help·info) equal tempered and Play (help·info) just. Pythagorean diatonic scale on C Play (help·info). + indicates the syntonic comma. In music theory, a diatonic scale (from the Greek διατονικός, meaning "[progressing] through tones", also known as the heptatonia prima) is a seven note octave-repeating musical scale comprising five whole steps and two half steps for each octave, in which the two half steps are separated from each other by either two or three whole steps. This pattern ensures that, in a diatonic scale spanning more than one octave, all the half steps are maximally separated from each other (i.e. separated by at least two whole steps). The term diatonic originally referred to the diatonic genus, one of the three genera of the ancient Greeks. In musical set theory, Allen Forte classifies diatonic scales as set form 7-35. These scales are the foundation of the European musical tradition. The modern major and minor scales are diatonic, as were all of the 'church modes'. What are now called major and minor were in reality - during the medieval and Renaissance periods - only two of seven modes ('church modes') based on the same diatonic notes (but forming different scales when the starting note was changed). Depending on which of the seven notes is used as the beginning, the positions of the intervals, the half-steps, end at different distances from the starting tone, hence obtaining seven different scales or modes which are as already mentioned, deduced from the diatonic scale. By the start of the Baroque period, the notion of musical key was established—based on a central triad rather than a central tone. Major and minor scales came to dominate until at least the start of the 20th century, partly because their intervallic patterns are suited to the reinforcement of a central triad. Some church modes survived into the early 18th century, as well as appearing occasionally in classical and 20th century music, and later in modal jazz. The earliest claimed occurrence of diatonic tuning is in the 45,000 year-old so-called "Neanderthal flute" (Divje Babe flute) found at Divje Babe. Although there is no consensus that this is a musical instrument, there has been one claim that it played a diatonic scale. There is evidence that the Sumerians and Babylonians used some version of the diatonic scale. This derives from surviving inscriptions which contain a tuning system and musical composition. Despite the conjectural nature of reconstructions of the piece known as the Hurrian hymn from the surviving score, the evidence that it used the diatonic scale is much more soundly based. This is because instructions for tuning the scale involve tuning a chain of six fifths so that the corresponding circle of seven major and minor thirds are all consonant-sounding, and this is a recipe for tuning a diatonic scale. See Music of Mesopotamia. 9,000-year-old flutes found in Jiahu, China indicate the evolution, over a period of 1,200 years, of flutes having 4, 5 and 6 holes to having 7 and 8 holes, the latter exhibiting striking similarity to diatonic hole spacings and sounds . Using the 12 notes of the chromatic scale, 12 major and 12 minor scales can be formed. The modern musical keyboard, with its black keys grouped in twos and threes, is essentially diatonic; this arrangement not only helps musicians to find their bearings on the keyboard, but simplifies the system of key signatures compared with what would be necessary for a continuous alternation of black and white keys. The black (or "short") keys were an innovation that allows the adjacent positioning of most of the diatonic whole-steps (all in the case of C major), with significant physical and conceptual advantages. The modern keyboard is based on the intervallic patterns of the diatonic scale. whole-whole-half-whole-whole-whole-half: where half means semitone (half a tone); whole means tone. The degrees of the scale are also known by traditional names. These names, starting from the bottom of the scale, are the tonic, the supertonic, the mediant, the subdominant, the dominant, the submediant, and the leading tone. 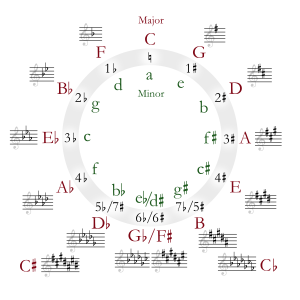 The degrees of the natural minor scale have the same names, except rather than having a leading tone, the seventh degree is instead known as the subtonic. In solfege this is regarded in two different ways: either as "La–Ti–Do–Re–Mi–Fa–Sol–La" or (again) as "Do–Re–Mi–Fa–Sol–La–Ti–Do." Western harmony from the Renaissance until the late 19th century is based on the diatonic scale and the unique hierarchical relationships, or diatonic functionality, created by this system of organizing seven notes. Most longer pieces of common practice music change key, which leads to a hierarchical relationship of diatonic scales in one key with those in another. Technically speaking, diatonic scales are obtained from a chain of six successive fifths centered at D, in traditional tuning systems such as Pythagorean tuning or meantone temperament. The set of intervals within each tetrachord comprises two tones and a semitone. The diatonic scale has specific properties that mark it out among seven-note scales. David Rothenberg conceived of a property of scales he called propriety, and around the same time Gerald Balzano independently came up with the same definition in the more limited context of equal temperaments, calling it coherence. Rothenberg distinguished proper from a slightly stronger characteristic he called strictly proper. In this vocabulary, there are five proper seven-note scales in 12 equal temperament. None of these is strictly proper, i.e., coherent in the sense of Balzano; but in any system of meantone tuning with the fifth flatter than 700 cents, they are strictly proper. The scales are the diatonic, ascending minor, harmonic minor, harmonic major, and locrian major scales; of these, all but the last are well-known and constitute the backbone of diatonic practice when taken together. Among these four well-known variants of the diatonic scale, the diatonic scale itself has additional properties of what has been called simplicity, because it is produced by iterations of a single generator, the meantone fifth. The scale, in the vocabulary of Erv Wilson, who may have been the first to consider the notion, is sometimes called a MOS scale. The diatonic collection contains each interval class a unique number of times (Browne 1981 cited in Stein 2005, p.49, 49n12). Diatonic set theory describes the following properties, aside from propriety: maximal evenness, Myhill's property, well formedness, the deep scale property, cardinality equals variety, and structure implies multiplicity. ^ "Random Samples", Science April 1997, vol 276 no 5310 pp 203-205 (available online). Stein, Deborah (2005). Engaging Music: Essays in Music Analysis. New York: Oxford University Press. ISBN 0-19-517010-5. Kilmer, Crocket, Brown: Sounds From Silence 1976, Bit Enki Publications, Berkeley, Calif. LC# 76-16729. Balzano, Gerald J. (1980). "The Group Theoretic Description of 12-fold and Microtonal Pitch Systems", Computer Music Journal 4 66-84. Balzano, Gerald J. (1982). "The Pitch Set as a Level of Description for Studying Musical Pitch Perception", Music, Mind, and Brain, Manfred Clynes, ed., Plenum press. Clough, John (1979). "Aspects of Diatonic Sets", Journal of Music Theory 23: 45-61. Johnson, Timothy (2003). Foundations Of Diatonic Theory: A Mathematically Based Approach to Music Fundamentals. Key College Publishing. ISBN 1-930190-80-8. Kilmer, A.D. (1971) "The Discovery of an Ancient Mesopotamian Theory of Music'". Proceedings of the American Philosophical Society 115, 131-149. This article is licensed under the GNU Free Documentation License. It uses material from the Wikipedia article "Diatonic scale". Allthough most Wikipedia articles provide accurate information accuracy can not be guaranteed.